Key changes in the amendments to the Pharmacy Operations and Drug Scheduling Act include shifting the responsibilities of applying for a new pharmacy licence, renewing a pharmacy licence, and submitting changes of pharmacy licensure information from the manager to the direct owner. Authorized representatives for a pharmacy need to be prepared to collect and submit all the information required to complete application and renewal processes online through the College’s eService’s site. They also need to continue to report any changes to a pharmacy’s licensure information to the College. Learn more about how to select appropriate authorized representatives for your pharmacy in this ReadLinks article. The authorized representative of the direct owner of a new pharmacy will have to submit all ownership-related documents, a pharmacy diagram and fees when applying for a new pharmacy licence. See this article for more information about ownership structure and requirements for licensure. If the authorized representative of the direct owner of an existing pharmacy does not have the business licence of the pharmacy readily available when completing the pharmacy licence renewal application, he/she may delegate the upload of the business licence to the manager. The authorized representative of the direct owner will be responsible for communicating this delegation to the manager and ensuring the business licence of the pharmacy is uploaded by the manager on eServices no later than 30 days before the pharmacy licence expires. The College must receive all required documentation in order for the pharmacy licence renewal application to be considered complete and a new pharmacy licence to be issued. If the College does not receive all the required documents, the pharmacy licence renewal application will be forwarded to the Application Committee for review. During the transition period, pharmacies whose direct owner is a non-publicly traded corporation will be required to submit the BC Company Summary of the direct owner as well as certified copies of the central securities registry (aka shareholder register) for the direct owner and any parent companies of the direct owner that are non-publicly traded corporations. Depending on the type of change, a change application must be submitted to the College within a prescribed period, and before the effective change date, in accordance with regulations made pursuant to the Pharmacy Operations and Drug Scheduling Act, otherwise it will be referred to the Application Committee. The authorized representative will have access to eServices to submit applications for change of indirect owner and change of manager. All new indirect owners and new managers will be required to complete their POE before the effective date of change. The authorized representative of the direct owner of a pharmacy will be responsible for ensuring the new indirect owner(s) or manager submits their POE before the effective change date. Failure to report changes in accordance with the legislative timeframe may result in referral to the Application or Inquiry Committee. The authorized representative and manager together will be responsible for submitting the pharmacy closure application. The Pharmacy Manager will continue to be responsible for the actual management and operation of the pharmacy. Pharmacists hold the knowledge, skills and abilities to ensure patient safety is protected in the management and operation on a pharmacy. All managers must comply with all applicable duties under the Pharmacy Operations and Drug Scheduling Act, the Health Professions Act, and the College bylaws. Depending on the practice setting, additional responsibilities for managers are set out in sections 24 and 29 of the new Pharmacy Operations and Drug Scheduling Act Bylaws. All pharmacy owners are accountable for providing safe and effective care by ensuring their pharmacies are compliant with legislative requirements for pharmacies in BC. 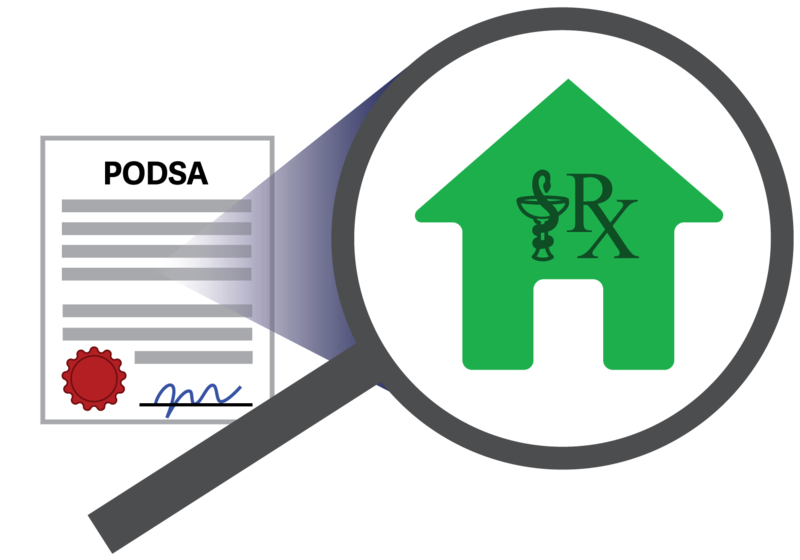 All direct owners and indirect owners must comply with all applicable duties under the Pharmacy Operations and Drug Scheduling Act, the Health Professions Act, and the College bylaws. They must also read, understand, and be familiar with the federal and provincial legislation governing pharmacy practice before commencing and while holding the position as a direct owner, an indirect owner or a manager. Specific responsibilities of a direct owner, an indirect owner, and manager are set out in section 18 of the new PODSA Bylaws. The licensure section of our website is currently being updated to reflect these new requirements and a new licensure guide will be available in the coming months.